Direct taxation is considered as an area within the almost exclusive competence of the individual Member States of the European Union. Some politicians believe that if the European Union intervenes in the tax systems of the Member States, the financing of the public sector of the Member States could be at risk. Even against this background, however, the European Union has exercised considerable influence in the area of direct taxation of Member States. Despite the fact that unanimity among the Member States is required to reach a Community decision in the area of direct taxation, it is now clear that the European Union has gained legal competence in the field. The adoption of pertinent directives is clear evidence of that. Of greater significance, however, is the increasing number of cases in which the European Court of Justice decides that specific elements of national tax legislation are in breach of fundamental freedoms provided for in the EC Treaty. the territorial extension of the free movement of capital. Direct Taxation in Relation to the Freedom of Establishment and the Free Movement of Capital uncovers the present principal standpoints of the Court, how those standpoints have evolved, and how they are likely to develop in the coming years. As all proposals on unified corporate taxation of the European Union must consider the findings of the European Court of Justice on the compatibility of national tax legislation with Community law, and as individual Member States must consider and follow the case-law of the European Court of Justice when revising old tax legislation and adopting new legislation in this area, the significance of this penetrating analysis cannot be underestimated. It will be of immeasurable value not only to European policymakers and tax lawyers, but to tax and business lawyers worldwide engaged in European commerce. Abbreviations. 1. Introduction. 2. Direct Taxation: The EC Treaty and Community Policy. 3. The Prohibition against Discrimination and Non-Discriminatory Restrictions in Relation to the Rule-of-Reason Doctrine. 4. The Freedom of Establishment and Direct Taxation. 5. Grounds of Justification: Accepted and Rejected Grounds. 6. 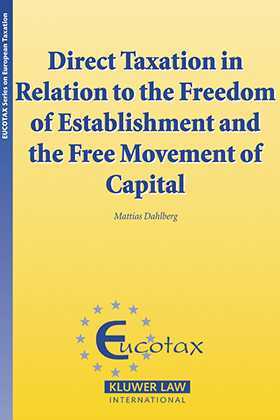 The Free Movement of Capital and Direct Taxation. 7. General Conclusions. Acknowledgements.